My work is all hand made. 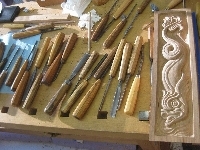 I carve wood using chisel and mallet. From 1984-87 I studied printmaking and sculpture at the Art Students League of New York. From 1989-91, while living in Oslo, Norway, I interned with Eric Fridstroem, master carver at the Viking Ship Museum. He hired me in 1991 to help him carve a replica of the elaborately carved 12-foot-tall "Aal Portal" medieval stave-church doorway. Since 1992 I've worked as an artist and artisan, accepting original art commissions and sculpting architectural, ornamental and liturgical designs in a variety of wood. I've exhibited at the International Contemporary Furniture Fair, the Architectural Digest Show, The American Craft Council Baltimore Show, and craft galleries across the country. 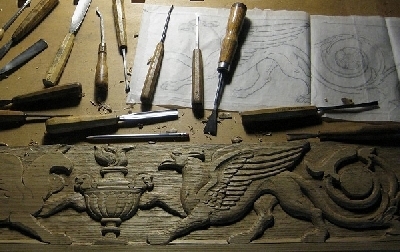 I teach traditional woodcarving classes from my Long Island City studio. I've also taught classes and workshops at the American Folk Art Museum, Peters Valley Craft Center, 3rd Ward, the Institute of Classical Architecture and Art, and Eastfield Village's Great American Craftsmen workshops. I've appeared with my artwork on the Martha Stewart show. I sculpt the numinous. The animating spirit of the object informs the carving, the trance-like process of carving and shaping the wood brings forth the spirit. Hopefully, my carved designs give the sense of being poised to move the moment your back is turned. I want someone hundreds of years from now to recognize that spirit leaping from my carvings. My work explores a life-long obsession with animals and our kinship with them throughout art history. I converse with Assyrian lions, Egyptian gazelles, Greek hippocamps, Viking dragons, leaping folk art horses. My own designs are my replies, and often refer back to specific details that drew me in. My wood sculpture reflects on humanity's contradictory relationship with other animals (including our tendency to forget that we too are animals), and our use throughout history of animal iconography to express the numinous. Above all, I am drawn to chimeras and guardian figures - in religious art, folk art, and architectural decoration. I intend my sculpture to delight the eye and feed the spirit, as do the hand-crafted objects that continually inspire me.